In this corner, weighing in at about 200 lbs [well, that is what it FEELS like – leaning over to get this on a rack is no feat for the timid. Neli was able to do it, but not without a few remarks :-)], but really at 68.4 lbs, the Esoteric K-01. And in the other corner, at 37.5 lbs, the EMM Labs XDS1. We have been dealers for EMM Labs for about 7 years, if I remember correctly. We would like to be dealers for Esoteric someday, when we expand our operations, [in the not too terribly distant future we are fervently hoping!]. That said, the shootout did not reveal any serious surprises that a skeptical reading through the current voluminous content on the web does not already point out. Here are Neli and P. configuring the Esoteric K-01 to generate output on the single-ended outputs. We also tried both the 4X oversampling and DSD filters [I thought the DSD filter was more digital sounding, Neli and P. thought it had more resolution and liked it better]. Previous tests had shown little difference in performance between balanced (XLR) and single-ended (RCA) interconnects [irregardless of the ARC reportedly being a balanced architecture]. [The Fluke multimeter was used to bias the Lamm amps after their recent move to this location, with presumably a different wall voltage than the previous location across town]. That Odin interconnect is kind sticking out of the rack at an odd angle, isn’t it? 🙂 All I know is that *I* was out of the room at the time :-). Both the K-01 and XDS1 were put up on HRS Nimbus Couplers – significantly better than the sound with the standard feet. We played mostly light Jazz, large scale classical, and the 1st cut off of Radiohead Amnesiac. All told we spent about 5 hours at this shootout. We first did a round of shootout with the Synergistic power cord on the players, and then a round with the Nordost Odin power cord. The Odin brought the performance of the 2 players MUCH closer together [bringing subtlety and imaging to the K-01 and more slam to the XDS1] but their differences were still quite evident. Strangely enough, these 2 players were closest on the track I played, the Radiohead. Notes are coming from all over the place anyway, so the K-01 did great, and the XDS1 really brings out the voice of the singer and his longing to be left alone. On this track the K-01 was more like a kid running around in a candy store, listening to this note, then that note…the XDS1 more holistic, more drug-like . I also want to say that, contrary to what I have read elsewhere, the K-01 does NOT have more resolution – in fact it has less – the K-01 does emphasize the main body of each note more than the XDS1 however, and that might be interpreted as detail by some, but the overall information here is really is less because the subtle, more nuanced parts of the notes are quite a bit less prominent. This is great! Direct comparisons between competing products are a lot more useful than your average review I think. Cool to see it done on a different system as well. More of this please! Appreciate the shootout. Love the blog and the writing but please keep in mind Audio Federation has a financial interest in selling the XDS1 and not the K-01. Although, I do agree with their assessment of the player having heard the k-01 and k-03. The Esoteric player has an advantage in the “computer audio” realm with the assync dac inputs if you are into that…..
We have plans to do many more shootouts – and hopefully in ways that are incontrovertible [don’t want to say HOW just yet… but use your imagination :-)]. You are right, the K-01 has a USB input and the XDS1 does not [unfortunately one of the worst connectors in the history of electronics] which does have the advantage of convenience over the better sounding, albeit more esoteric [:-)] Toslink etc. connectors. Both players do try to address the computer audio audiophile’s needs and Neli has researched this for several people and hopefully she will post some factoids here. The last truly-new-and-truly-useful web site for audiophiles that I discovered was the now-venerable Computer Audiophile. Well, here’s another: Audiophile’s Guide to the Galaxy. This isn’t a simple “clipping service” like Daily Audiophile (also useful). Rather, it’s an edited compendium of all-things-audiophile. That is, the site creator attempts to add order (and opinion) to the content. And, I must say, he adds content that I have never seen before. The proprietor of the site, Mike Davis, is a deep thinker. He tends to seek categories, root causes, hierarchies – to bring order to the chaos that is the 21st-century high end. While he also runs a high-end retail establishment (Audio Federation; it might be moving to North Bay), he does a reasonably good job (IMO) of keeping his writing balanced. Other BAAS members disagree, citing concerns of bias. So YMMV. Anyway, like him or not, I think that you’ll find this site useful. Dig around…and enjoy! Yes, we are SO VERY MUCH looking forward to the Bay Area [probably North Bay but we are trying to be flexible]. We have been waiting for the home to sell… but have now started considering other possibilities because in this housing market nothing is predictable. Will probably never get away from ‘concerns of bias’ – don’t know of anyone who expresses an opinion not being accused of that by somebody or another. All we can do is try our best to explain in massive detail how we come to our conclusions and hopefully most people can think about things and either decide we have a good case or are flawed in our logic somewhere [and if so, please share! Always up for changing my mind if I am wrong about something, or at least knowing about other points of view and trying to incorporate them into understanding better all the ways people enjoy music reproduction]. I really like the new look of the site. I have heard the new Esoteric K-01 numerous times in a friend’s system. I have not heard it in my own system. His prior unit was a P03/ D03/G0S. I do have several thoughts: 1) the K01 is by quite a bit the most musically natural digital unit that Esoteric has brought to market; 2) it is not an XDS1 but it is a big improvement over the earlier Esoteric sound; 3) it has phenomenal bass and dynamics; and even though it is a one box player, it sounds significantly more natural when used with the G0s clock. The addition of the clock does make it quite expensive but is a big improvement. People younger than 30 to 40, all they know is CDs. No wonder they view the high-end suspiciously when all the sound they have heard from music reproduction systems has .been so… unmusical. At long last, this is what I’ve been looking for! A shootout between top digital players. I just wonder why most established review magazines don’t do this. Thanks Mike and Neli for this. It’s a much needed thing in the world of audiophile. I very much hope you’ll be able to do a shootout between the XDS1 and the Meridian 808.3 since they are in the same price range, the latter retailing for $20k. The 808.3 is known for its apodising filter that ameliorates not only post-ringing but pre-ringing already in the music signal during the mastering process. Since there’s no way for me to listen to either one here in Malaysia, a shootout by you guys would be the next best thing. A little over a year ago we did do a shootout between the 808.3 and the previous generation EMM Labs CDSD transport and DCC2 DAC. We even had enough cabling so that we could hook both up at one time, and play the two copies of a CD in each and swap back and forth [although this technique can often be more confusing than illuminating, it is also kind of fun :-)]. The older DCC2/CDSD edged out the 808.3 [bypassing both preamps] in naturalness and resolution, but it was not night and day. The guy did decide to get the XDS1 based on this comparison – but we were a little worried at the time that he might not hear the differences [you never know going into these things what kind of ears people have. His apparently were [at the time anyway :-)] pretty good and he wanted to ‘go for the gold’]. Meridian players seem, to me anyway, to be a step above their other gear. The family sound of their players are not always consistent – sometimes going for a little warmth over resolution, sometimes the opposite, and the 808.3 seems right down the middle, to my ears. The Esoteric will have more dynamics and bass resolution, the XDS1 much more subtle detail, darker background, and natural musicality. But compared to the vast majority of players that, to my way of thinking, go for detail for the sake of detail [and which are usually so noisy that the subtle details are lost, making them sound bright and edgy], or those that go for dullness out of fear that any detail will be bright and edgy, the 808.3 is a real contender. How does XDS1 compared to Audio Aero’s La Source (and Capitole Reference)? If I listen to CDs only, is there any sonic difference between Capitole Reference, La Source (and La Fontaine), and XDS1? Which player (or any other one-box player) is a better match for a tube (pre and amps) system with Sonus Faber Amati futura speakers if I look for real-life, musical, and sweet sound with excellent bass slam? Or anyone got any comments/experience on my above comments? 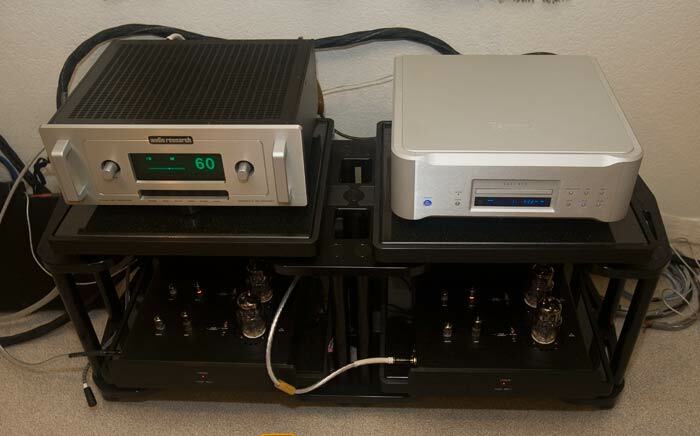 How about the CD8 from Audio Research? The XDS1 sound will be ‘in kind’ but better compared to the CDSD/DCC2 described in the write-up. Both players will do what you want with the Audio Aero being more sweet and the Emm Labs being more real-life. As far as bass slam – both these players are about the same with a modest amount of slam – and not sure Sonus Faber is known for slam since their old Amatuer speaker [though I have not heard the Amati Futura much – being more familiar with the Amati and Stradivarius] – so your work is cut out for you. I would try good [but not bad] vibration control and appropriate cabling to eek out as much slam as possible. And if you want excellent bass slam more than real-life, musical, and sweet sound [your use of the word ‘excellent’ might be an indication of this, don’t know] then the Esoteric player would be the better choice. Very interesting article! Shootouts aren’t so frequent in the HI-FI world. I recently bought a K-01 and I am impressed by its performance, but I keep somewhat puzzled by its numerous setting capabilities (four optional filters and x2, x4 and DSD processing -or none): 5×4 = 20 possibilities! And I haven’t enough time to carefully test all this. Which configuration do you prefer (for symphonic music and high quality pop/rock recordings)? Many thanks for the tests you carry out and publish. Sorry it took awhile to get the latest settings from P. but he says he prefers these to those the player was using during the shootout at his place [as described in the main section of the post above]. I would say that your musical tastes and his are very similar. The player is not in front of me, so I am only hoping that this description makes sense to you and that you enjoy these settings as much as P. does! I’m really grateful to you, Mike (and possibly Phil)! The settings you mention are perfecly clear. I’ve had time to experiment a few settings these days, and x2 upsampling is definitly the best. This raises a problem: is the x4 sampling neglected with the K-01? It greatly shrinks the soundstage and makes the souds “lean” or “dry”. Regarding the FIR – SDLY filters, the difference is noticeable; wider and deeper soundstage, warmer voices with the FIR; more definition, dynamics and accuracy with the SDLY. Choosing one combination chiefly depends on the source: kind of music and recording features. As for 1 or 2 (FIR1-2, SDLY1-2), I must admit I heard no difference at all. I will now experiment power and modulation cables. Any advice to help me make the right choices? Most of the modulation cables are availabale as RCA and XLR; which ones sound best? Definitely your thanks should go to Phil. Been hoping for other Esoteric owners to chime in…. I think Phil is now 100% ODIN and Jorma Prime cables and PC at this point. I do not think one picks cables especially tuned to a particular component – one just picks the best cables that one can afford, the best cables being those that sound the same (aka excellent) with everything. 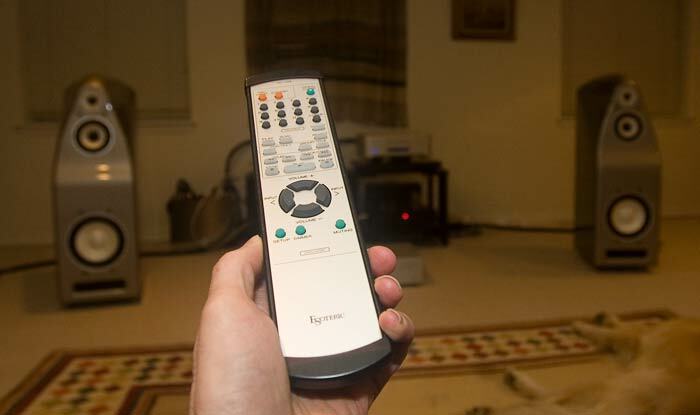 However, if your system is too bright and you want to use cables to tone it down some then that is a different story. Almost all the other brands out there will roll off several of the annoying frequencies [and unfortunately some not so annoying ones at the same time], Kubala-Sosna probably being one of the least harmful of this group of cables albeit at the more expensive end. Reference: our mails from Aug 10 and 14. You alreday helped me a lot with your positive answers, so I hope I won’t bother you with an extra question about the K-01. I’ve been using RCA and XLR modulation cables, and it seems to me that the XLR connection is slightly better – this is difficult to apprecialte, since the cables must be the same reference, with RCA and XLR plugs of course. And I think that RCA plugs are significantly better in quality than XLR ones (within the same price range). Now, it seems that some people consider K-01s haven’t got a balanced output circuitry -just XLR connectors plugged to RCAs, like in so many cheap rigs. In this case, of course, RCA connectors would be better than XLRs…These peole say that the only way to find out the truth is dismantle a K-01 unit and investigate the circuitry. I won’t do this, since my knowledge of electronics is purely theoretical. Please, Mike or Phil, do you have an opinion about this -balanced architecture or not for the K-01? This would be of interest, since this CD reader has now a great reputation all over the world -if my memory serves me well, you intended to become an Esoteric dealer, Mike (sorry if I’m mistaken). Best regards to all the persons that would read my mail. Neli and Phil have spent more time messing with different kinds of cables on the Esoteric than I – and I thought she was going to chime in here… but I think the general point is that it is rare for a source component to be ‘fully balanced’, per se, and the performance of a system usually depends much more on what the preamp likes to see, what it works best with: a balanced input or a single-ended input. So, yeah, I am punting on this question :-). Perhaps others have have anecdotal experiences they want to share? Just a few further thoughts. I have now had an extended audition of the Esoteric P-02/ D-02 and the combination is rather significantly better in all ways than the K-01/ G0 combination at about the same price. I have experimented with the settings and the ones recommended by Mike work the best for me; however, the filters need approximately 200 hours of break in which means that if you cycle through them without breaking them in they will sound more alike. Note that the manufacturer confirmed the breakin time. Unfortunately the factory presets are the worst choice of all. Don’t think we’ve heard of the P-02 / D-02. All the options and versions are enough to drive one batty [get it? batty? Halloween fever strikes even here at Audio Federation :-)]. Good that they are continuing to improve their players. Kind of scary [:-)]. Started a conversation with Ray Kimber at RMAF [in that case about Sony] about how if some of these larger corporations [in this case TEAC] start producing extremely competitive products that the face of our industry may change quite a bit. Never finished that conversation [Ray is WAY too busy to have time to have a real conversation – but it did appear he has thought about this. He works closely with Sony. ], and I do not know if this eventuality would be a Good thing or Bad thing. But it may be an interesting and very possible future that all of us might want to think about. A similar trend is rich holding companies buying up companies like Sonus Faber, ARC, McIntosh, etc. One benefit, for example, is that there could be real money behind some serious marketing in high-end audio for the first time in many decades. Then maybe the public-at-large might find all of a sudden that they are also audiophiles… again. Thanks for the shootout. I have a Nagra CDP that has been in several shootouts in my home. 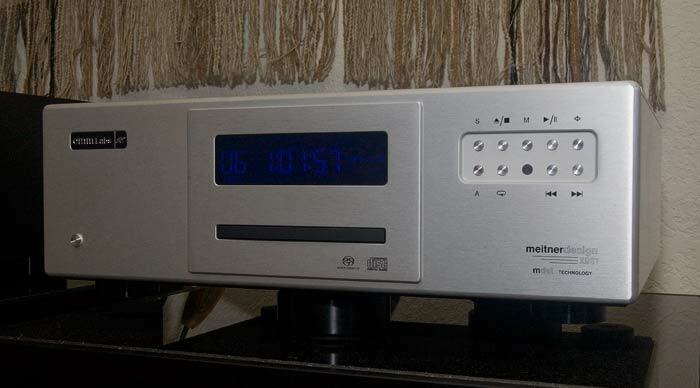 It has beaten Meridian 803.i (a very dull sound), AMR777, AR cd8 (a big disapointment), EMM CDSA, Ayre CD5xe (very good for its price),Krell Chiper (very good bass) and was on the same level as APL best Esoteric CDPmod machine (forget the name). Any thougths on the Nagra sound vs the two CDP in the shootout? I use Kubala Emotion IC bween CDP and amp. I tested ODIN and it was clearly better but what a price! I sold my Nagra CDP. in replace of a K-01. I did a quick comparison between both. Both are very good. but K01 has more dynamic / bass than the Nagra. Would been happy with either. But my main reason of selling was. 1. nagra has bad reseller market, loss money on all my Nagra gear. PLP was the only piece that move fast, still got low ball. My Nagra CDP and PMA has been on the market for over 1 years at 1/2 off the list. and not bite. Hell with it took a big lost on CDC and move it. and the PMA still sitting in boxes. so good luck if you were to sell. 2. The main reason of getting the K-01 was for the USB input. I really was to use a music server and listen HD tracks. I had many options and Esoteric and DCS were the 2, I was choosing from. Really want a all-in-one box solution as DCS were require a few box stack. I could had the scalatti DAC (spelling) really cheap under $8k but will require the buy a world clock in order to do USB input. and I still dont have cd/transport. And again I was worry about reselling it about a few years later. Not that I dont like the super high end company. I luv it, but sometimes hard as hell to sell. I convinced a friend to bring over his XDS1 to compare to my P-03/D-03. I found the Esoteric pair more ruthlessly revealing, which sounds glorious on the few discs that are really well recorded, but much as you describe it for many not-so-well-recorded discs. By contrast, to my ears—and my friend reluctantly agreed—the XDS1 tends to homogenize the music, making very different sounding recordings sound more like each other. It would seem that we heard the similar differences but interpreted them quite differently. I should add, though, that I’ve never liked the effects of upsampling, especially to DSD: to me, it consistently blurs the music. On the Esoteric pair, I prefer playing CDs without any upsampling. The XDS1 is the second EMM Labs player I’ve tried and not liked. The other was the CDSA-SE. Which is too bad, because as a Canadian I’d prefer to support a domestic manufacturer. I think we are hearing the same things, and everyone understands us having to exaggerate the differences we hear in order to describe it to people who aren’t here, but the idea of whether ultimate truth lies in ‘ruthlessly revealing’ versus ‘homogenizing the music’ is a great one. This comment is not about you or your friend but the broad spectrum of all audiophiles and their expectations. One school of thought practices high-end audio by insisting that the best systems must always sound bad on all but the most perfectly recorded media and needs an ‘edge’ to it to sound exciting [this is exemplified by the old Krell on Wilson Watt/Puppy systems]. 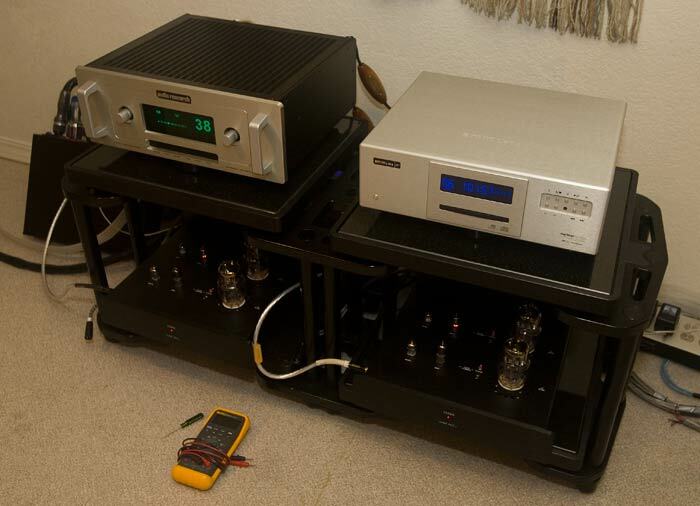 Another school, at the other extreme, figures that music should sound… musical, and if you can’t play your favorite music on your $$$ high-end audio system, then there is something seriously wrong. Might as well spend the money on something more fun, like a Porsche :-). After listening to the ultra high-end Audio Note digital, on which we can play and enjoy 99% of all our CDs just fine, many from the early 80s – I think that one can hear differences between well-recorded media and extremely poorly recorded media, but it doesn’t have to be exaggerated and in-your-face aggressive and unpleasant. So old CDs often sound thin, and you can hear what sound like square waves where there should be gentle decay, and there is a lack of resolution on, say, electric guitar notes that would make them SCREEETCH on inferior playback… but it in fact doesn’t HAVE to bite your ears off. It just sounds inferior, not painful. I think some gear exaggerates problems like abrupt changes in the incoming signal a tiny bit and this can be unpleasant for some people. Other gear smooths it out a tiny bit, and this becomes too boring for other people. It would be interesting to do a second shootout with the newer versions of both contenders, the XDS1v2 vs. K-01x. It would also be interesting how TSDx with DAC2x perform against the two all-in-one solutions. I’m still happy with my older TSD1 / DAC2 SE combo but nonetheless curious how they would compete against the newer flagships. I tried to contact customer service of Emm Labs several times ask about their offered X-Upgrade for my DAC2 SE, but I got no answers. It’s still on their website but maybe it’s not available anymore. I’m also thinking about a change to Esoteric K-01, but I’m not sure if I will like it because I’m so attuned to the “house sound” of EMM Labs. Yes, it would be interesting to compare the newer versions of both players, I agree — when we get the chance we will definitely do so and report on the results. 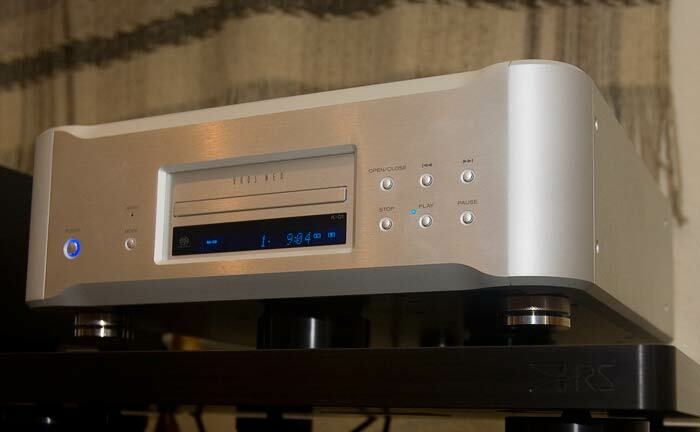 It might no longer be possible to update your DAC2 SE to the DAC2x … we squeezed another customer’s upgrade in under the wire this past spring. Please send me a private email with your serial number (neli at audiofederation.com, or any of the email options on our site) and I will work on it. I should say, the other customer I mentioned is super happy with the results, both using streaming audio inputs and using his TSDX. 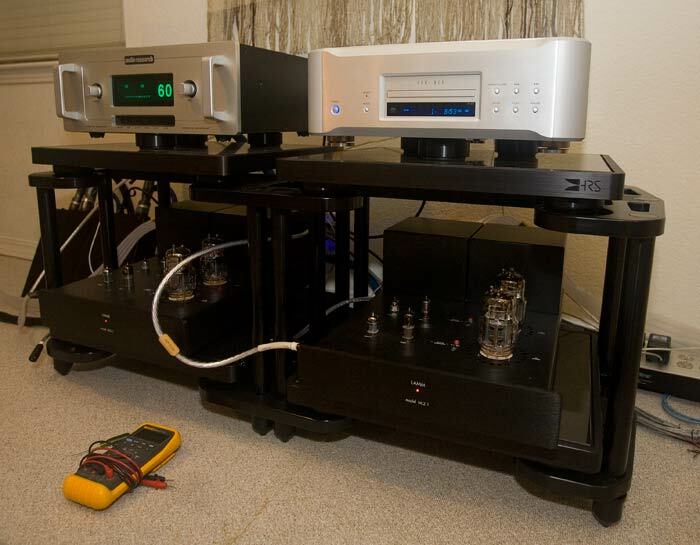 my system if you are interested….I’m not affiliated with Esoteric (apart from being a customer) nor am I a dealer or reviewer. Product shoot-outs like this are an essential part of the audio experience and for many of us, the only practical way to get feedback from ‘people with good ears’ to help us form our potential buying decisions. I have a lot of respect for both brands here and am a long-time, multiple generation Esoteric owner. Your observations on the Esoteric unit(s) being power cord sensitive is right on the money! Every one of their units back to my first (DV-50S, then UX-1 Limited, P-03U/D03/G0s and the last 1.5 years with the P-02/D-02 have shown that to be absolutely true in my experience as well. I’ve found that Elrod Statement Gold power cords go a long way to elevating performance on all my gear, the Esoteric players and transport/DAC combos being no exception. They, like all other high-end gear are also interconnect-sensitive; perhaps it is the fine choice of cables you used for the shoot-out versus other alternatives but I found it interesting that you noted sensitivity to power cords, but not to interconnects (as they are that as well). Can you comment on the extent of break-in of the two units you’ve tested and reported on in the original shoot-out? Given the number of configuration permutations (up-sampling, filters, etc…) with both units and particularly the K-01, I would have expected to see that a good level of break-in would have been done on all combinations for both players before the shoot-out. More to the point, with the K-01 and all its filters alot of us with the K and P/D units have found that until one puts 300-350 hours (at least) on a specific filter, that the unit is not at its best. Same for CD or SACD playback independent of each other. It’s a daunting task but breaking in a unit like the K-01 or the P/D units takes the sum of break for all playback options (CD or SACD plus each digital filter (once only per filter); that’s in the neighborhood of 1500-1750 hours, minimum. An additional point to consider is your use of single-ended outputs for the K-01; while these units and the P/D units sound very good using single-ended outputs; it’s been noted by anyone who touches one (reviewer or user alike) over the last few years that Eso units sound their best using balanced XLR outputs. I’m not an engineer so I cannot tell you why, however, this has been my experience as well. Did you use any up-sampling or filters of any kind? Many of us have found the K-01 and P/D units sound there best using either 176.4 or DSD up-sampling for RBCD and the S_DLY2 or S_DLY1 filters (based upon personal preference). with a proper burn-in of all its options before trying it. Would it be possible for you to comment on the above and if possible, re-run the shootout with the latest generation of the EMMlabs as well as the K-01X taking the above into consideration? 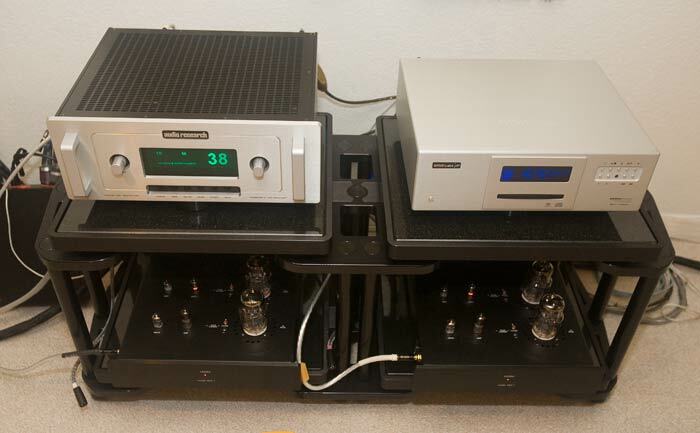 Candidly, your feedback on the EMMlabs units tells me it may be time for me to listen again to their one-box and 2-box solutions; I like what I read very much; more detail along the above lines would be appreciated as well. Thank you for taking all this in the sprit it is given,..from a fellow music lover and audio “nut” and as meant to be 100% constructive. Have a great weekend! Wowee … lotta stuff here. I don’t think I’ll get to all of it today. I would say, you should try and hear the newest generation of emmLabs, and the newest generation of Esoteric, because things do move faster with digital playback than they do with, say, vinyl. In the review above, which is at this stage of the game an old review, yes, both the K-01 and the XDS1 were fully broken in, each with, I would guess, at least a year’s playback time on it, with both CD and SACD. However, we did make some adjustments to the filters after the initial comparison, as noted in the comments above. Regarding interconnects, I would say that the K-01 and the XDS1 are both, in a system that is capable of revealing such, quite sensitive to both interconnects and power cables. Many folks have said that the Eso should always be balanced. In my personal experience, the cable itself is far more important that whether or not it’s balanced, and some of that will depend on what exactly is at the other end of the cable, and what its preferences and capabilities are as far as input mode goes. As an explanation, I would say that the connectors mounted in the chassis do have a sound. I did ask someone at Esoteric about this a long time ago and they said that it shouldn’t matter. From our experience, the emmLabs gear is neutral regarding XLR vs. RCA. Audio playback is not a one size fits all thing. When it’s *your* system, the important thing is that it suit *your* sonic preferences. 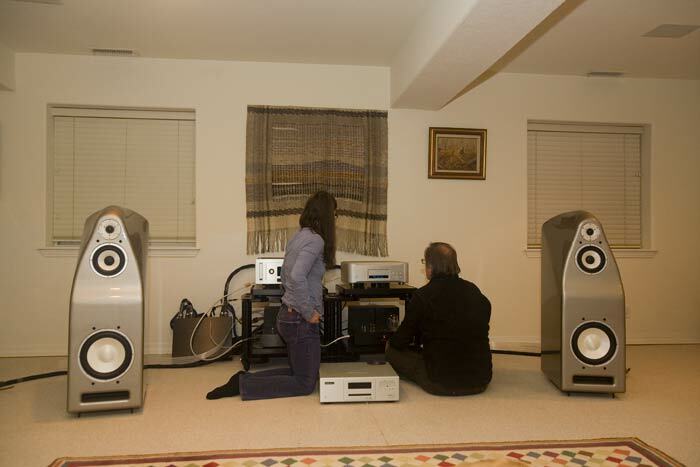 We like both Esoteric and emmLabs sonically. Their house sounds are somewhat different. Yes, it’s time for a re-do, and we will do so when the opportunity arises. Neli,…thank you very much for the detailed response. 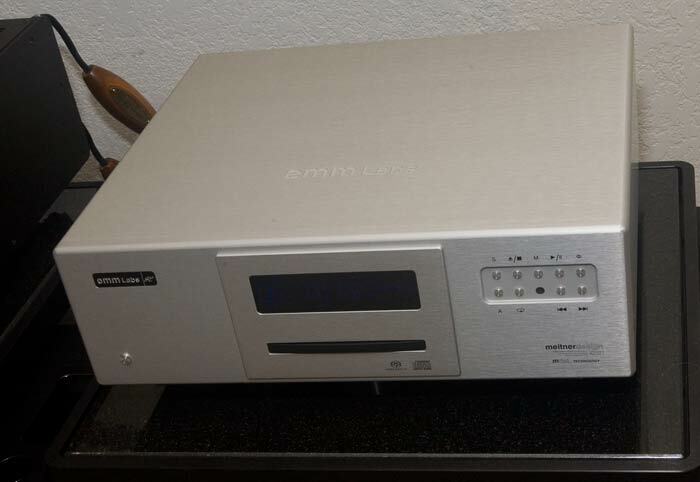 I look forward to getting my hands on a new EMMlabs unit and giving it a spin. As for the latest Esoteric units, I am currently very happy with the P-02, D-02 and matching C-02 pre-amp and A-02 amp. 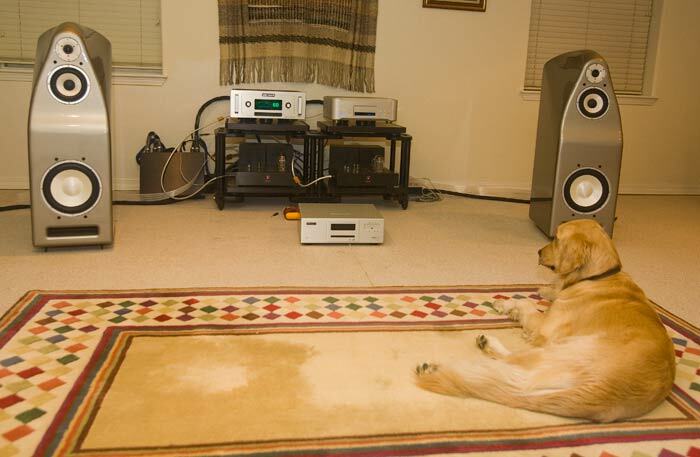 It’s a wonderful sounding setup in its own regard however my ears are always open to new alternatives to bring even more organic and musically ‘right’ sounds to my listening room. Have a great week!